Rabbinical students reach Kenai Peninsula Black suitcoats, dress slacks and white collared shirts are normally reserved for funerals on the Peninsula, but not for traveling rabbi Yoshi Bendet. He and Mendy Greenberg spent the past week visiting Jews living in the area as part of a statewide tour. The duo's travels are part of a world-wide faith-based program of the Chabad-Lubavitch sect of Hassidic Judiasm to serve Jews living in remote communities. The program serves Jews of any type, and atheists, as well. "That one person is a world unto themselves," said Bendet. Bendet said that the purpose of their travel is to connect Jews in rural areas without established religious and cultural communities. The group provides religious services to those who don't have access to a temple. The ordained rabbi said these services include Mezuzah, scrolls hung on doorways; Tefillin, leather boxes containing verses from the Torah; and Shabbat candles. Shabbat, the Jewish sabbath, begins on Friday at dusk and ends Saturday night. They also passed out updated literature, answered questions about the Torah and led group prayer services. "It's best to pray in a synagogue, but one can pray individually," he said. The lack of cultural infrastructure affects the Jewish lifestyle in non-religious ways as well, according to Eileen Mills, of Kenai. "It's a lifestyle," she said. "We're a separate race of people." Mills said that meeting with the two bolstered her spirit, because she hasn't met another Orthodox Jew since she moved here 11 years ago. Speaking with them kept her Jewish identity strong and offered her an opportunity to speak about religious and cultural issues. Kosher food, prepared in accordance with Jewish law, is almost non-existent on the Peninsula, she said. The scarcity makes observing Passover nearly impossible. Mills said that last year she had her dinner shipped in from Washington state. 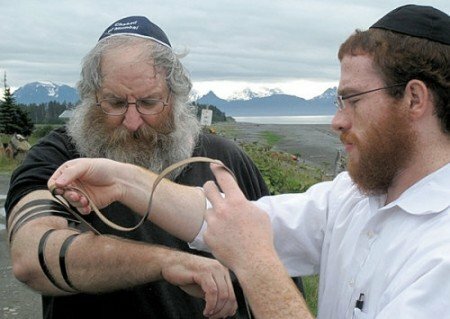 Anchorage Rabbi Yosef Greenberg, Mendy's father, said that Rabbi Menachem Mendel Schneerson began the program after the Holocaust. Rabbi Schneerson, known to his followers as the Rebbe, decided that American Jews needed to reinvigorate the faith. He asked his followers to spend their vacations visiting Jews in small communities. The program began 60 years ago and has been in Alaska for 35, according to Greenberg. Bendet, who has visited the Peninsula twice with the younger Greenberg, said that they make contact with Jews they've already visited, and primarily learn of others through word of mouth. The $10,000 Alaska trip includes southeast Alaska, the Peninsula, Anchorage and the Fairbanks area, but once included Barrow and harder to reach locations. "The past few years it's been just driving, no flying," Rabbi Greenberg said. "Financially it's a lot cheaper." Shuttling about Alaska is no easy feat, but Bendet said that reaching fellow Jews makes up for the strenuous nature of the trip. The rabbi has been on nine outreach trips, five of which took him overseas. He helped reconstruct the Chabad Center in India following the Mumbai terror attacks. "It was similar type of work, but under different circumstances," he said.